Those who are new to 188bet can take advantage of an unbeatable welcome offer that amounts to a guaranteed free bet with no strings attached. All that is necessary upon joining is to place any initial wager up to a maximum of £25. If that first bet fails to win, 188bet will refund the amount that was lost up to £25. There are currently no promotions on sports betting. 188bet - Growing Reputation as "The Asian Sportsbook"
Established online in 2006 by Cube Limited, a British Isles company licensed out of the Isle of Man, 188bet has a reputation for taking some risks of its own. It hitched its future to the growing trend of gambling in Asia, focusing on the emerging markets for online wagering in China and Southeast Asia. In 2009, the web site operator was reprimanded by U.K. football representatives for providing the opportunity for live betting on academy football games. The league maintained that wagering should not be allowed on youth events, and 188bet subsequently suspended such activities. 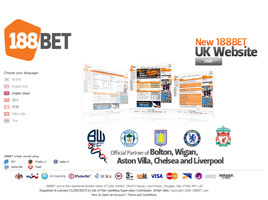 However, in 2010-2011, 188bet has made an investment in a different way to win, picking up the sponsorship of not one, but two Barclays Premier League teams: the Bolton Wanderers and Wigan Athletic. Of course, bets are welcome on both clubs, as well as a broad range of markets in sports around the world. With English as its primary language, 188bet offers a complete range of traditional sportsbook services online, plus an affiliated casino gaming web site. It employs software created by Microgaming and complemented by innovations from EntertAsia. The latter is based in Macau and since 2006 has been developing 188bet's "live gaming" applications, which replicate the experience of being in an actual casino with a real dealer. The partnership with an Asian provider comes as no surprise to those who have been following 188bet's fortunes. Betting on sports has become a fast-growing trend in the Far East, and 188bet has positioned itself for success, opening mirror sites in Chinese, simplified Chinese, and Vietnamese over the years. With the World Cup fervor strong in 2010, offering attractive soccer odds put 188bet in the forefront of bookmakers focused on Asian clientele, a lead that it is unlikely to give up in the future. In total, 188bet offers members the opportunity to bet on some 4,000 games across 75 leagues throughout the world. It also offers 1,500 in-running matches live betting excitement. Apart from football, wagers are also accepted for such major team sports as basketball, American football, baseball, cricket, field hockey, futsal, handball, ice hockey, lacrosse, rugby, volleyball, water polo. Bets can also be taken for athletics, table tennis, badminton, beach volleyball, boxing, beach soccer, cycling, darts, golf, gymnastics, motor racing, Olympic events, rowing, snooker, and tennis. Quite recently, executives at 188bet made an effort to rid their membership of professional gamblers. They stated that would "only accept recreational players" and reasonable steps would be taken to hedge action from players believed to be non-recreational. In Asia, 188bet has been offering special promotions to attract new bettors. Among these is a 30% Deposit Bonus for new sign-ups, worth up to £100. This offer is made in addition to the guaranteed free bet. Of particular importance to Asian-based members, currency can be denominated and deposited in Hong Kong dollars, Malaysian ringgit, Indonesian rupiah, Singapore dollars, Chinese renminbi, or Thai baht as well as U.S. dollars, British pounds or Euros. Although players from the Philippines, Singapore and the United States are not allowed to register, customers from Malaysia, Indonesia and Vietnam are now permitted to deposit funds into their 188bet accounts via local bank transfer.